Happy Humpday! Am I the only person who is ready for summer to be over and fall to be here? Fall used to be my favorite season when I lived in the midwest and it definitely happens to be one of the things I miss the most about living in Florida. We really don't get much of a "fall" here, we certainly don't get the pretty color change of the leaves or the cool, brisk days but we do get a bit lower humidity and some slightly cooler temperatures so I make my own fall any way I can. One of my favorite ways to bring a little fall into my life is to mix fall and summer styles. I'm still loving the off the shoulder trend (and I don't think I'll be stopping that any time soon!) so when I saw this floral print off the shoulder top on Le Tote I definitely had to scoop it up. I love that the colors are richer instead of pastels and the long sleeves make it more "fall" appropriate even though the top is still light enough to wear in the Florida heat. Unfortunately we haven't quite gotten out of the high humidity phase here so excuse my crazy hair. Even though I've lived here for almost 20 years now (yikes!) I still can't get used to the fact it can not only rain at any moment and then be sunny 30 seconds later, it can also rain WHILE it's sunny out. Fall is my fave too, even though it seems like it's 2 weeks in Atlanta. I say we have 2 seasons: hot and not as hot! ;) Until then, you are keeping cool in this gorgeous off-shoulder top! Love this! Perfect for the end of summer, beginning of fall! The colors in this blouse are so pretty and you styled it perfectly with those shorts! Cute!! What a pretty print on this top! I definitely agree with you on the fall weather. I'm ready for it to get here! I am loving this pretty off the shoulder number! So cute and so fab! Love the way you styled it by adding in the hat so fun! How gorgeous is this print on you?! I absolutely love how you paired it with black--it really makes the blue in the top stand out!! I am beyond ready for fall! 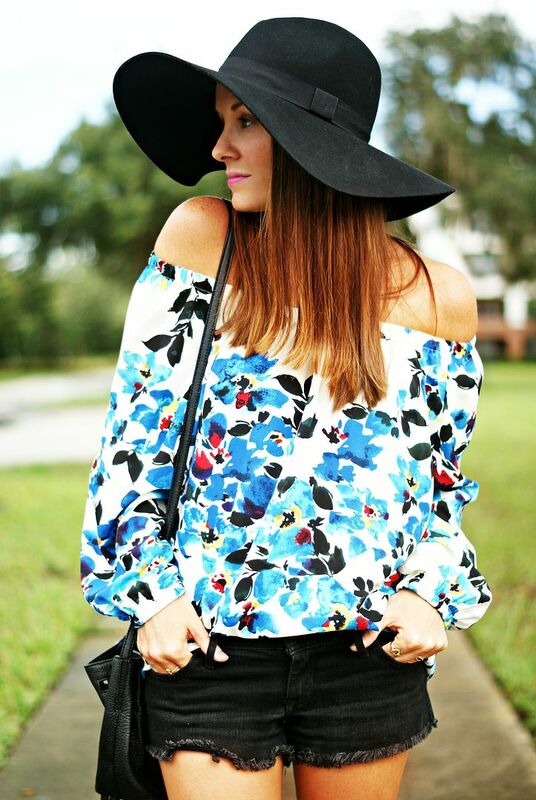 Love this floral off the shoulder top and that floppy hat! It looks so cute on you! What a fun top! I love the floral print, and your shorts are adorable too! You look ADORABLE in the floppy hat and OTS blouse! And yes SO ready for cooler temps! That top is gorgeous and I love that floppy hat!! I'm ready for fall too- speaking of... American Horror Story starts tonight and I cannot wait!! ah i love the top on you! i totally got that in my le tote too - couldn't resist! i love it with the black jean shorts though - the black accents are a great choice! I can tell that you're definitely ready for some more fall-ish weather to get to Florida ASAP. I'm over here celebrating a high of 88 (with heat index of 96) because it feels so much cooler than what the rest of summer has felt like. Hurry up, cooler temps! Such a cute top! Love it paired with the hat too! Love that top and your lip color! I would DIE if I lived in Florida because I just looove cool temps! Give me all the chunky sweaters and boots! You look beautiful, Pamela! You've done a good job at mixing a little bit of Fall and Summer. I can't even imagine "going thru" Fall in Florida with it's crazy weather and humidity. But I guess you get used to it. Such a pretty look on you! Loving the colors in that top. Even though it's bright and floral this top is so perfect for fall! I really like how you styled this look with a hat. It ties the whole outfit together! I'm definitely ready for Fall too! Breaking out the boots and scarves is my favorite! You look so cute! Fall fashion is my fave too! Love how you styled this pretty OTS top, you look super cute! If I was living in Florida I would not be missing fall or winter weather at all. With that I like the top, shorts and sandals. Very summery with some fall colors. Up in NY I go for summer fashion for as long as I can. Love how you made this more fallish! I would so miss the seasons if I lived in Florida, too! Love the colors and print of this top! The nice thing about the OTS trend is that it's easier to get a more flowy/cooler look for when the temps stay on the higher side! Love the whole outfit! I am ready for fall, too. It was 90 here today. UGH! Seems like it's never going to cool down! I cannot get enough of off the shoulder either! I love this one, the print is so pretty and perfect paired with the black! Love this look. Gorgeous top! All the quintessential "fall" things are my favorite, but I doubt I'll be seeing much of that here in Houston. I do love that floral top, so pretty and the colors make it transition to Fall beautifully! Beautiful top! So chic and pretty look! That hat looks SO great on you! Sign me up for Fall too please! Such a cute outfit and perfect for Florida! I love the pops of color in the top and off course the off the shoulder look. I need more off-the-shoulder dresses and tops in my closet. I just love this look! The top is absolutley perfect on you! Thanks for linking up and hope to see you again next Wednesday! I love your outfit! This short is a must have, I need to buy it for the next summer.